1987/8 - BOOTY 1 and 2 --- Jewellers & Metalworkers Guild. Venue: Crafts Council of Ireland Dublin gallery. Modern jewellery exhibitions. 1990/91 - VICE VERSA . 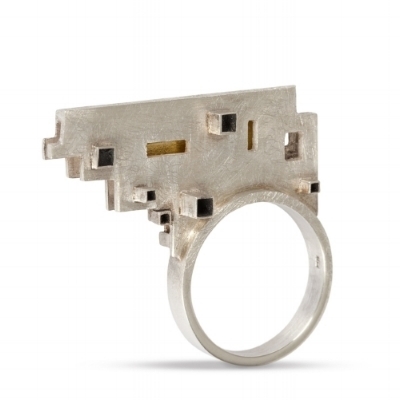 Jewellery as Sculpture, Sculpture as Jewellery. This juried touring exhibition was a collaborative venture by the Jewellers & Metalworkers Guild and the Sculptors Society of Ireland. The show, which had an educational remit toured Ireland over a period of two years. Venue: Dublin Castle. Jewellers & Metalworkers Guild. The piece “Embrace” was inspired by the play of light on the architecture outside my studio window. This piece of jewellery is intended to be: playful, the negative spaces allows light to permeate the work, and the interior is overlaid with gold to intensify the outward reflected light. EMBRACE RING. 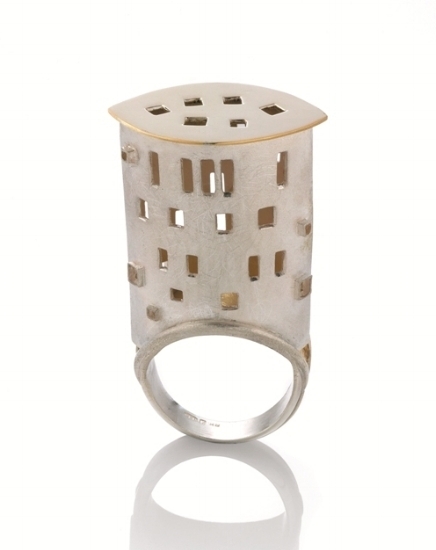 Silver ring with 18ct gold detail, textured and polished finish. Waterways Centre, Grand Canal Dock, Dublin. Tower Design Network. The exhibition was a series of contemporary artworks inspired by the Albert Bender Collection of Asian Art in the National Museum of Ireland, Collins Barracks. Group exhibition of fifteen jewellers. The Fumbally Exchange, Dame Lane, Dublin 2. I love the waterside by my studio. It is a scene of constant movement, patterns, light and dark, reflections, bridges, water and stories. My work plays with these forms and textures and is inspired by the skills that brought them to us. ..Materials: Silver with embellishments of gold and oxidisation. 1999/2000 The Art of Gold- Award – CCOI- International touring.